An assortment of Full Size and Fun Size candies. Gift Size 12" x 10" x 16"
~ ~ ~ ~ ~ ~ ~ ~ ~ ~ ~ ~ ~ ~ ~ Every bouquet is truly a work of art and is professionally arranged by our award winning designers. 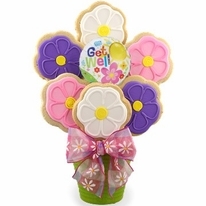 When purchasing our bouquet gifts, you should feel confident that you are sending a delicious and unique gift that has been expertly designed just for you. When comparing the value of the product inside our gifts to the cost spent, please remember that these gifts are quite labor intensive and a monetary value should be placed on the overall gift and not just the amount of product included. 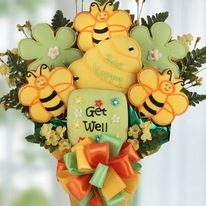 Cheer them up with this fun-loving Get Well Candy Bouquet. 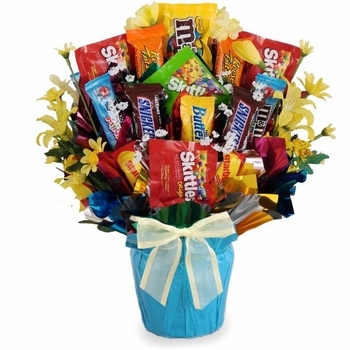 No one enjoys being laid up recuperating from the flu or while on the mend from surgery or an accident so bring some sunshine and a great big smile their way with this Get Well Candy Bouquet. Tucked inside an adorable band-aid container an assortment of only top name candy bars and sweets like Snickers, Skittles, Reese's and M&M's will be included with this gift. 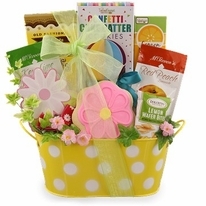 We're sure they will be able to find more than just one or two favorite sweets among them. 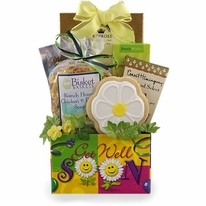 Send well wishes to someone and wait for the smiles to arrive!